This is a bottle I am already familiar with since I had it quite often when I used to live in Montpellier: It’s a true classic of that region and a safe value that I’m always happy to have in the glass (older vintage TN, see here). So I was quite thrilled when a friend brought me that bottle which stems from the specific Languedoc AOC Pic Saint-Loup which lies North of Montpellier. It is a reminder of good old times and brings the sun into our somewhat grey German summer at the moment. 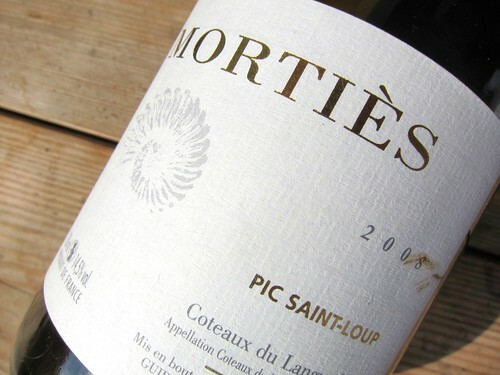 This 2008 Mortiès is the first vintage issued by the new proprietors of the domaine, the Guiraudon and Moustiés families who are currently converting the estate to certified organic winemaking standards. Let’s see what it looks, smells and tastes like in the glass. Itt is exactly what I expected. Intensely dark, inky color with purple hue; yet very shiny . Nice fruit nose with raspberry and other berries. No organic or biodynamic stinkyness here. Feels fruity to the point, not like marmelade or overripe Spanish wines. Appears also juicy on the palate with soft tannins and a fresh but not too strong acidity. The 14,5% alcohol are sensable sometimes – so there are moments the wine doesn’t feel so light. But this red can also be drunk chilled though; this is the way I remember we got it served on the terrasse of Les Bains de Montpellier, a restaurant in Montpellier I can only recommend. So it’s a very decent Southern French red which is easy drinking but with a hint of complexity. So juicy it’s gulpable, but also with a seductive perfume.